An American in Ireland: Who was Eleanor Bradley-Peters? Last week I was touring around the area known as the Saint Mihiel Salient during WWI and I came to the town of Thiaucaourt, France. For reasons I can't recall now I walked into the local cemetery in which was buried one, lone British soldier - T J Kite of the Grenadier Guards who died after the Armistice on December 8, 1918. As I turned to leave the little graveyard I saw a cross that was shaped just like the crosses that mark the graves of fallen American servicemen in Europe. The cross read simply "Eleanor Bradley-Peters / July 6, 1865 - November 1, 1941." When I got home I Googled her name, expecting to find she was an English or American poet who had opted to live in France. First I found a reference to an Eleanor Bradley-Peters born July 1, 1855 and died November 1, 1941. Again, I didn't know anything about her, but I thought to myself, "Good for you - moving to France and lopping 10 years off your age. Sure you died under Nazi occupation, but you were 86 (or 76) by then. I hope you gave em hell." Unfortunately, I dug a little more and the story turned. 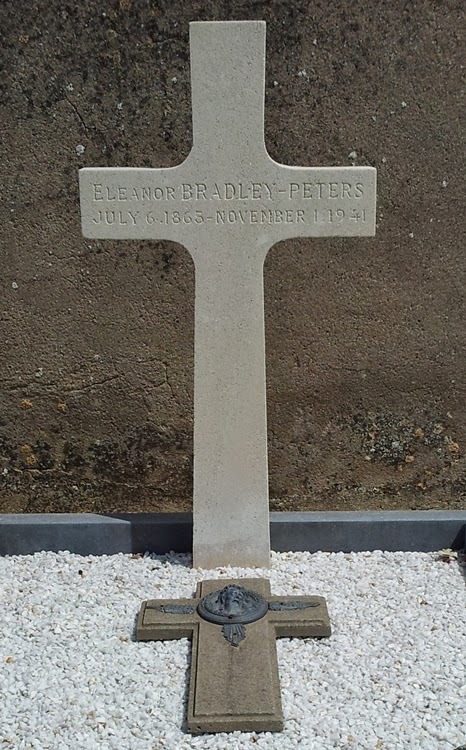 Her only son - Edward McClure Peters Jr - was killed in action at Seicheprey on March 11, 1918 and is buried in the St Mihiel American Cemetery, which is only half a mile down the road from where Eleanor is buried. So, how did Eleanor come to be buried there? I have no idea, although it seems clear that she felt a great need to be near her son's grave. I'd love to know more. Did she move to France shortly after WWI finished? Or did she provide for her burial there in a will? There is probably no way to know for sure, but I will probably keep looking for a while. If I find more, I'll provide an update.